OUR BEAUTIFUL HEATED POOL IS OPEN MEMORIAL DAY THROUGH LABOR DAY! Here at Forest Ridge, you will find a CLEAN, quiet, pet friendly, family campground, featuring beautiful, luxury cabins with PRIVATE hot tubs and a heated pool. Choose from pet-free or pet-friendly cabins. 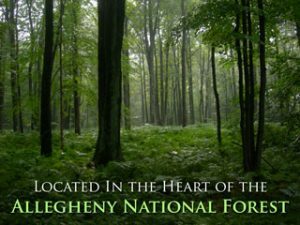 We are conveniently nestled in the Cook Forest area and the Allegheny National Forest. Loleta State Park is three minutes in one direction, with the Clarion River not far beyond. Buzzard Swamp Bird Sanctuary, Minister Creek and Beaver Meadows are just a short distance away, in the other direction. The village of Marienville is 2.5 miles away with several restaurants and taverns, some with live music! We routinely hear that we have the cleanest bathrooms in the Forest! – We have cell phone service! – We have FREE Wi-Fi service! – We have a FREE pack-n-play for the baby to sleep in! -We NOW have three cabins that are PET FRIENDLY! – We have Air Conditioning in the Adirondack, Allegheny, Blue Ridge, Covered Bridge, and Rocky Mt. cabins! -We have Private Hot Tubs at the Adirondack, Allegheny, Blue Ridge, and Rocky Mt. cabins! The vast Allegheny National Forest has something to offer everyone, from enjoying the sights and sounds of nature, to using the many miles of hiking, snowmobiling, geocaching, cross-country skiing, and ATV trails. We offer 5 cabins and 38 acres of generously-sized campsites for your stay with us. Our rates are among the most competitive in the region. Try us once and you will become part of the “Forest Ridge Family” for life!